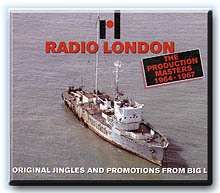 This double CD contains the complete set of the famous Radio London jingles, 'Big L' was the first radio station in Europe to use jingles produced by the Dallas based jingles company - Pams. These jingles would bring a touch of 'magic' to the station sound and are now regarded as master pieces. Also included are some re-mixes and a selection of Productions recorded by the legendary Kenny Everett. These are an example of Kenny's earliest work and are highly sought after. A 12 page colour booklet accompanies this collection with ,many photos and story. Limited edition. Contains 198 re-mastered and restored Pams original Radio London Promos, Jingles and Music Beds. 10. Wonderful Radio London - Big L! 12. Wonderful Radio London - Have You Heard? 15. Wonderful Radio London - Ole! 64. Radio London - Music Now! 66. Radio London (Music) for you and me - and me! 67. More music (more music) on Big L - Big L! 68. Radio London - Big L - Day and night! 77. Radio London - Super Hit one! 78. Radio London - Super Hit two! 79. Radio London - Super Hit three! 80. Radio London - Disc of the week! 85. This is it! Wonderful Radio London! 86. Wonderful, Wonderful, Wonderful, Radio London! COLLECTOR'S BONUS! PAMS SERIES 18 STEREO MIXES! 58. You get a positive charge out of Big L! 64. Good Morning the world is bright...with Big L! 66. You're a winner with - Wonderful Radio London - Big L! 67. T-G-I-F Thank Goodness it's fun with Big L! 68. Good Morning, everything looks good when you open your eyes with Big L! 71.	Who's got it? We've got it! 81. News comes first on Big L! 85. Wherever you go, go go with Big L - Go Go! 89. Oh come on horse whoah! 97. The one that's in on every play - Big L! 98. You're where it is!